ECG - Lakeland Animal Hospital, P.C. ​When any irregular heart rhythm is detected on clinical examination, an electrocardiogram (ECG or EKG) should be performed. The small electrical impulses normally generated by the heart are amplified 3,000 or more times and recorded by the ECG machine. An ECG can detect minor disturbances in the heart beat or rhythm and allow your veterinarian to diagnose many types of heart disease. 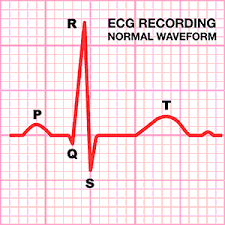 An ECG is a simple test to perform. Your pet is usually placed in a standing or lying position and electrodes are attached to the elbows and knees. A jelly or liquid is applied to improve electrical conduction between the dog and the electrodes. The ECG machine merely records the electrical impulses from the dog and there are no unpleasant sensations nor is there any danger to the pet. We send that information to a cardiologist for analysis over the internet. Results can be obtained very quickly for pre-surgical screening and overnight for more advanced diagnostic information. In some cases a more prolonged ECG examination is required. If this is necessary, a monitor called a Holter Recorder will be used. This monitor consists of a small pack that the dog wears for 24-72 hours, and records all heart activity during this time. This is a technique that is becoming more commonly used to precisely diagnose the reason for intermittent collapse in dogs with abnormal heart rhythm. Often an ECG examination is combined with chest radiographs (x-rays). ECG analysis is a safe, simple test that provides your veterinarian with valuable information about your pet’s health.